Through his music, acclaimed Italian composer and pianist Ludovico Einaudi has added his voice to those of eight million people from across the world demanding protection for the Arctic. Einaudi performed one of his own compositions on a floating platform in the middle of the Ocean, against the backdrop of the Wahlenbergbreen glacier (in Svalbard, Norway). The famous musician travelled on board Greenpeace ship Arctic Sunrise on the eve of a significant event for the future of the Arctic: this week's meeting of the OSPAR Commission, which could secure the first protected area in Arctic international waters. © Pedro Armestre/ Greenpeace Handout - No ventas -No Archivos - Uso editorial solamente - Uso libre solamente para 14 días después de liberación. Foto proporcionada por GREENPEACE, uso solamente para ilustrar noticias o comentarios sobre los hechos o eventos representados en esta imagen. 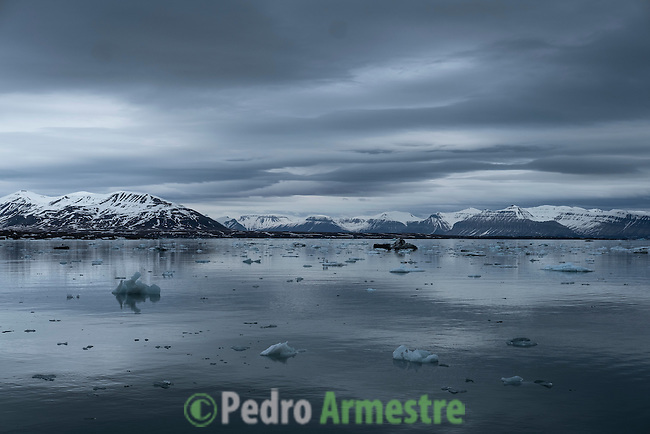 © Pedro Armestre/ Greenpeace Handout - No sales - No Archives - Editorial Use Only - Free use only for 14 days after release. Photo provided by GREENPEACE, distributed handout photo to be used only to illustrate news reporting or commentary on the facts or events depicted in this image.